Christmas is a special time of year and giving it a handmade touch will make it even more end earing. The Christmas tree is the focal point of the holiday season. 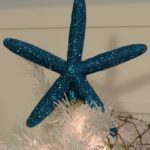 These beautiful handmade Christmas tree toppers will make your tree unique and take center stage. These are one of a kind creations you will not find at your local big box store! 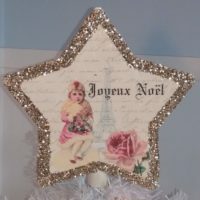 You can shop for Christmas tree toppers in shabby chic, French country, vintage and beach style designs. Each one is handmade with love. They also make wonderful Christmas gifts for those who are hard to shop for. I love to work with vintage images and incorporate them in my designs as much as I can. 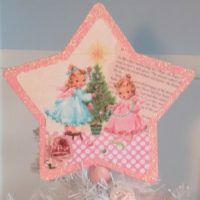 If you love and old fashioned Christmas you will love these tree toppers. 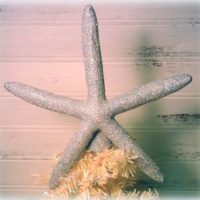 If you live by the sea you might like one of my glittered starfish tree toppers. They have been a best seller for years! Products 1 - 10 of 10. 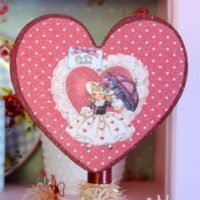 This vintage Valentine inspired heart shaped tree topper is perfect for decorating a tabletop Christmas tree for Valentine's Day. 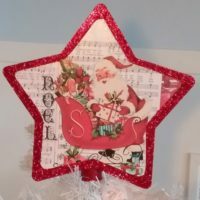 This gorgeous handmade Vintage Inspired Santa Claus Star Christmas Tree Topper will add a touch of nostalgia to your home this holiday season. 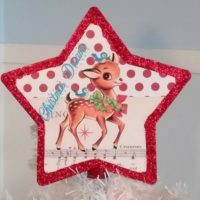 This gorgeous Vintage Inspired Retro Reindeer Christmas Tree Topper will add a touch of nostalgic kitsch to your tree this holiday season. 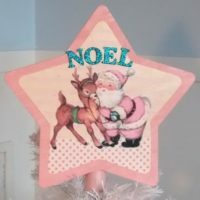 This gorgeous handmade Shabby Chic Pink Santa and Reindeer Christmas Tree Topper will add a touch of nostalgic kitsch to your tree this holiday season. 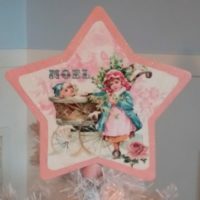 This gorgeous handmade shabby pink retro angel Christmas tree topper will add a touch of retro kitsch to your tree this holiday season. 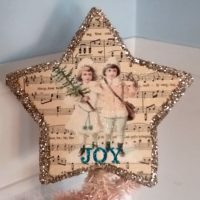 This gorgeous handmade pink shabby chic vintage Victorian Christmas tree topper will add a touch of old world elegance to your tree this holiday season. 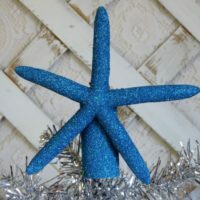 Give your beach inspired Christmas tree a whimsical touch with a handmade glittered starfish Christmas tree topper.